Designrulz loves the Murphy bed concept; it’s a great way to live comfortably in less space, since you don’t need a bed when you’re awake, and don’t need the living space when you’re asleep. Compact living. It’s not just for those who live in tiny apartments! In fact, whether a family resides in a one-bedroom rental or a three-bedroom house, chances are its members will claim to need more space. For those with higher spaces above but less square footage below, this design direction takes advantage of headroom while keeping clutter off floors and walls. We’ve seen some great examples, including the bed/desk/closet combination, this sofa/bed combo, and this elegant version, integrated with shelving. Designed by the studio of invention Décadrages and marketed under the brand name BedUP, the bed that falls from the ceiling is an innovation that will save 4 m² in your apartment, and for someone who lives in a small space .. 4 m² of space is pure gold. BedUp is a French creation that solves multiple problems with folding wall beds. It installs in your ceiling, rather than the wall, and sort of floats down when it’s bed time. No furniture-moving required! it can stop at various heights, using a variety of braces to help it integrate with your bedroom’s furniture. It’s even possible to integrate lighting into the bottom of the bed, for use when it’s in storage mode. First, as alluded to above, it shifts the burden to storage vertically rather than horizontally. 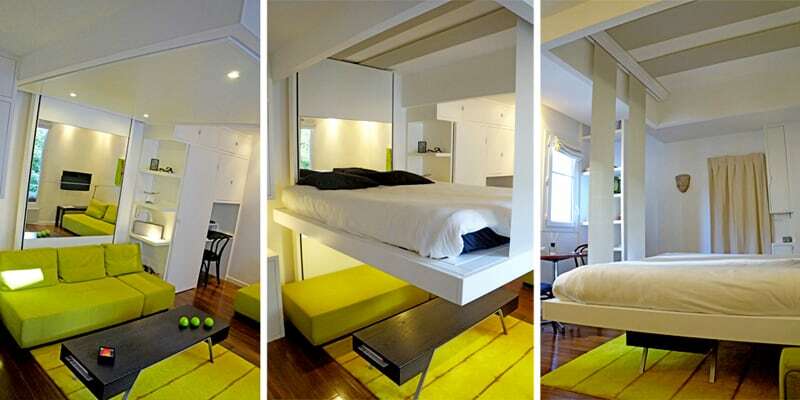 You could leave your stuff where it is, putting the bed above it. BedUp’s beech bed-frame can be raised up to the ceiling with the mattress and bedding still in place, using a mechanism that only requires one hand to operate. Now besides being functional, this bed has a clean design that is discreet and elegant.